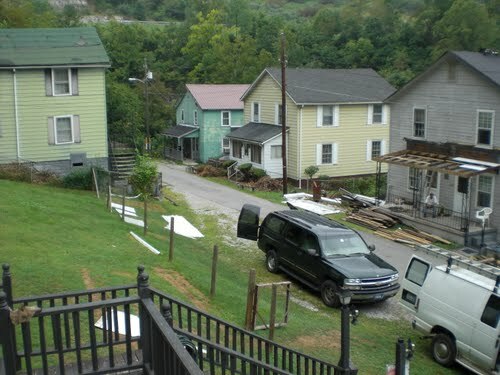 A rural community located at the base of Pine Mountain in Eastern Kentucky, Jenkins has one of highest rates of poverty in Letcher County. Letcher County was once a prominent coal mining area, providing over 24,000 jobs for the local population. With the decline of coal and the mining industry, the number of coal related jobs there has dwindled to about 100, and Jenkin’s population, now standing at just over 2,000, has steadily decreased. Poverty is widespread. Family-to-Family’s Jenkins community partner is Angela Gibson – the Family Resource and Youth Service Center liaison for the Jenkins Independent School District. Angela identifies families in need for the FtoF program and distributes monthly groceries to the families. In Jenkins, Family-to-Family partners with the Whitesburg Wal-Mart to provide groceries for our sponsored families. Jenkins and nearby McRoberts, KY families are also recipients of Family-to-Family’s Victory Garden program. Since 2010, about 20 families have received donated gardening equipment and seeds for growing beds of vegetables and fruit, often along with egg-laying chickens. Family-to-Family also provided supplies for a large community vegetable garden on the Jenkins elementary school grounds, which is used both as a teaching opportunity (the kids learn to compost as well!) and to provide vegetables for the whole community.